South Orange, N.J. – Christina Stoffo, a familiar voice to hundreds of thousands of radio listeners in New York and New Jersey, led a workshop on the evening of January 22 for 21 students at WSOU 89.5 FM, radio station at Seton Hall University. Stoffo, a Seton Hall graduate and former staff member of WSOU, worked with students on how to best deliver live traffic reports and connect with listeners. With nearly 15 years of on-air experience in the New York market, Stoffo has a tremendous amount of knowledge and insights to share with the newscasters and DJs of the student-run station. Ms. Stoffo works for Total Traffic & Weather Networks and is currently heard regularly on Z100, KTU, Q104.3, Power 105, NJ 101.5, 105.7 The Hawk, 94.3 The Point, and WDHA. She has previously appeared as a traffic reporter on FOX 5 in New York and was heard on the Michael Kay Show on ESPN Radio. Her visit to back to her alma mater was arranged by WSOU News Director Bob Towey and is the first in a series of talks and workshops by industry professionals that will take place throughout the spring semester. 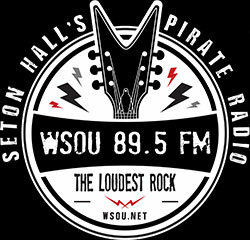 WSOU 89.5 FM, which began broadcasting in 1948, is the student-run radio station of Seton Hall University. Celebrated for its loud rock format and coverage of Seton Hall athletics, WSOU’s signal reaches all five boroughs of New York City and much of northern and central New Jersey, and is available on iHeartRadio. WSOU was the 2016 winner of the National Broadcasters Association’s Marconi Award for Noncommercial Station of the Year. More information about the station can be found online at www.wsou.net and www.facebook.com/WSOUFM. WSOU is part of the College of Communication and the Arts at Seton Hall University. Media Contacts: For more information, contact News Director Bob Towey at wsounews@gmail.com or General Manager Mark Maben at mark.maben@shu.edu / 973-761-9546.